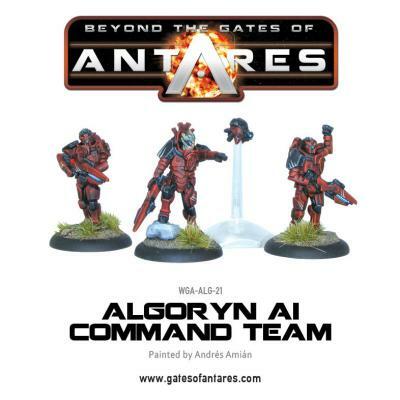 So the last few months have seen an absolute flurry of new releases for Gates of Antares. It doesn’t seem to matter what your flavour for the game is there is something for everyone, from nearly an entirely new set of Algoryn through to the massive Brood Mother. One of my personal Favourites and something I have been waiting for an ‘official’ model fro is the Concord Drop Troop Command. At a 141 points they come in reasonably cheap but you only get 3 models. 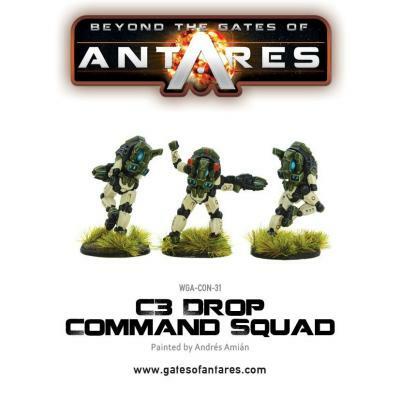 The Commander is obviously slightly better statted than the average drop trooper but not by a great deal, the main reason I want to field these is because I want to field a lot of C3 Drop Squads and you need the command Squad to unlock the Drop Squads. Seems a bit weird but Should look nice when done! I only have one squad at the moment so a few more squads will be needed. This will give me a reasonable force of Infantry that can zip around the battlefield whislt still getting a fair few shots off unimpeded.